Candied Pecans are sweet, crunchy and totally snack worthy. They’re perfect for topping salads, desserts, or just munching by the handful. I am not sure what the weather is like in your neck of the woods, but we’ve been experiencing fall-like weather here in Ohio for the last 3 days. The temperature hasn’t been above 65 degrees and the breeze is definitely crisp. Meanwhile, my step-mom is in Las Vegas and said it was almost 120 degrees the other day. If I’m being honest, I’m kinda lovin’ the cooler temps even though it means we’re taking a break from hanging by the pool. Instead we’re able to enjoy Elle’s new playset without sweating our booties off. Although, now that I’m thinking about it, I could definitely stand to sweat off a bit of my bootie. It’s so interesting how the weather can completely shift the foods I’m craving. 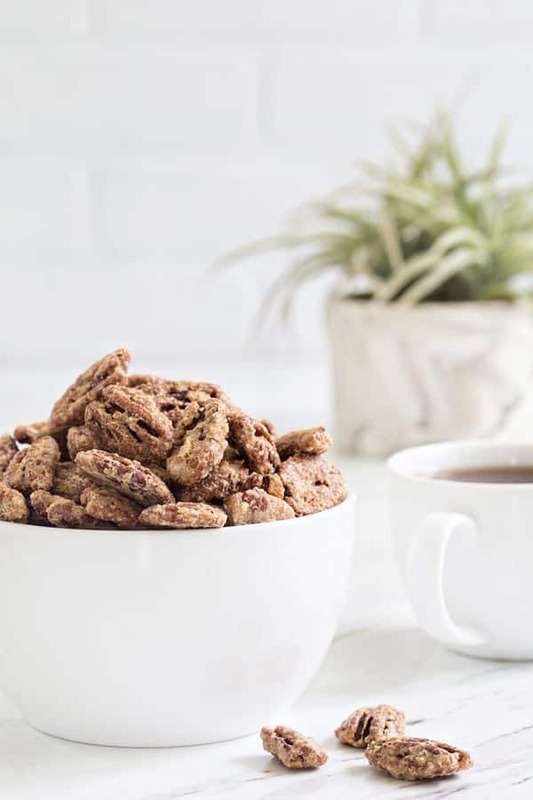 Instead of my morning iced coffee, I’ve been having a cup of my favorite cinnamon tea which I’m pretty sure played a part in me also craving candied pecans on allthethings. 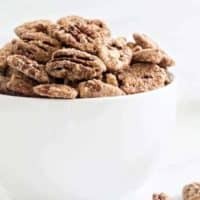 If you’ve never made candied nuts before, the process couldn’t be easier and it requires just a handful of ingredients that you probably have on hand already. You start by mixing up some sugar, cinnamon and a pinch of salt. If you want a really delish sweet and salty combo, just increase the salt a bit. Then you whisk up an egg white with some vanilla, stir in the nuts, and toss them in the yummy cinnamon and sugar mixture. Then you bake them at a low temp for about an hour until they’re perfectly sweet and crunchy. Let them cool and add them on top of everything you can think of. 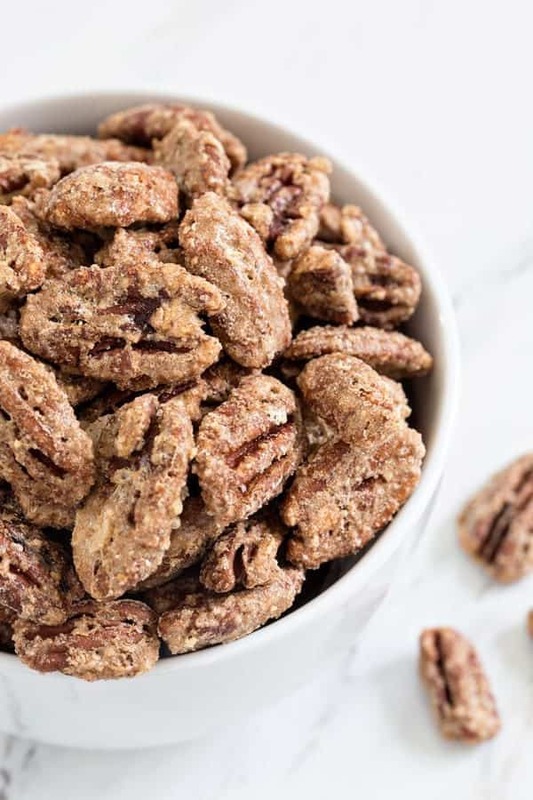 From yogurt parfaits and ice cream sundaes to spinach salad and pasta salad, these candied pecans are sure to become one of your new favorite toppers. And no judging here if you eat the entire batch straight from the container into your mouth over the course of 2 days, because I pretty much did just that! These are also a really fantastic way to add crunch on top of your morning peanut butter toast or with cream cheese on a bagel. If you’re feeling spicy, you could even add a pinch of cayenne and give your candied nuts a kick in the pants. These will last for about a month in an airtight container, or three in the freezer – if you don’t eat them all first! 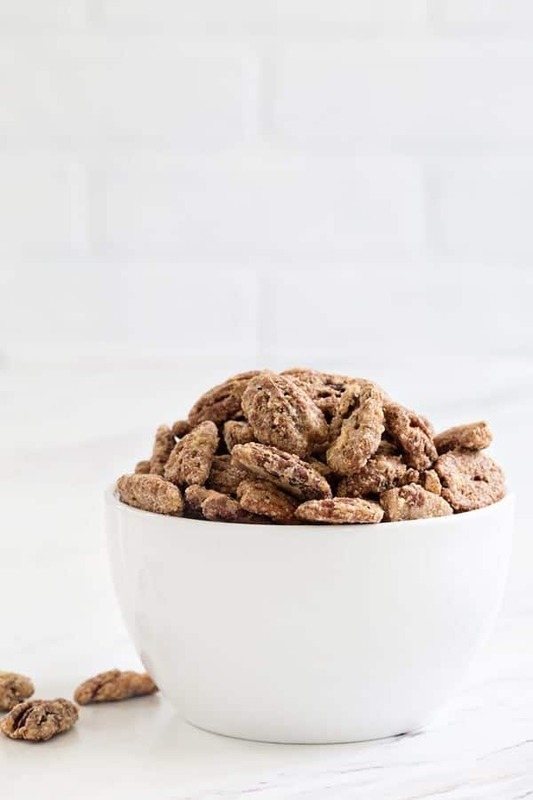 For more delicious snack recipes, be sure to check out this Sweet & Spicy Snack Mix and this Coconut Pecan Granola. In a small bowl, stir together the sugar, cinnamon and salt. In a large bowl, whisk together the egg white and vanilla until frothy. Add in the pecans and stir to coat. Stir in the cinnamon-sugar mixture and stir until the pecans are coated in all that sugary goodness. Spread the pecans onto the prepared baking sheet. Bake for 60 minutes, stirring the nuts every 15-20 minutes. Cool the nuts completely before serving, Store in an airtight container. these look delicious. I’ve had walnuts sweetened in a salad but no cinnamon was added. would it be done the same way minus the cinnamon? or perhaps you have a recipe you can share. thank you in advance. I LOVE candied pecans! And your idea to sprinkle them on top of a bagel with cream cheese – life changing! Sooo good, right? Thanks for stopping by, Kelly! Can you please tell me who makes your favorite cinnamon tea. I had a tea made back in the early 80s that was delicious, beautiful deep color when you added milk and such a taste that to this day I have not forgotten. But I cannot not find it so far. Anytime I hear of any one drinking a cinnamon tea that they love, I try to find out who makes it so I can try it out. Eventually I hope to find the one that I so loved. Thank you in advance. Oh and yes I will be making these pecans tomorrow, they sound delish! Hi, Barbara! I really like Tazo Cinnamon Tea. I hope you enjoyed the pecans! These look really good (and I love cinnamon so they really appeal). 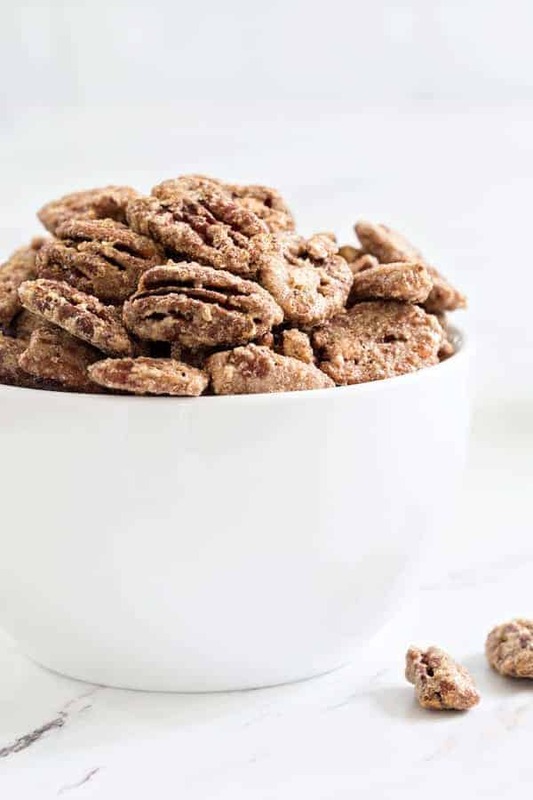 I’ve never made candied pecans before so I definitely need to try this recipe. Can’t wait to make them. Let me know how you like them, Edwina! They are sooo good! I hope you enjoy them as much as we do!